The damage from Hurricane Maria. PUERTO RICO’S MORGUE is overflowing with unclaimed bodies, the result of budget cutbacks in the US territory since last year’s devastating Hurricane Maria. The bodies of 307 people are now being kept in the morgue and in four refrigerated containers in a nearby lot, the authorities said. “The situation in light of the high volume of pending cases, lack of space and specialized personnel requires immediate attention,” legislator Juan Oscar Morales Rodriguez said on Twitter after inspecting the morgue. The head of Puerto Rico’s office of forensic sciences Monica Menendez acknowledged that the mortuary has run out of room and that 52 unclaimed bodies have had to be stored in refrigerated containers. She confirmed that because of budget cuts her office has lacked the specialised personnel to handle the caseload since the hurricane. “We’ve never been in this kind of situation before and we don’t want to reach this point,” she said. The official death count from the hurricane is 64, even though a recent study by Harvard University and Puerto Rico’s Carlos Albizu University estimates that there were as many as 4,645 hurricane-related deaths, many of them attributable to the collapse of the electric power grid. 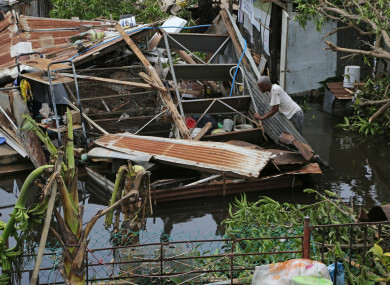 Hurricane Maria struck the island 20 September as a devastating Category Four storm. Email “Puerto Rico's morgue is overflowing with unclaimed dead bodies after a storm nine months ago”. Feedback on “Puerto Rico's morgue is overflowing with unclaimed dead bodies after a storm nine months ago”.